The Maguires of Tempo, Co. Fermanagh, were one of the greatest and most ancient of the Irish Septs. 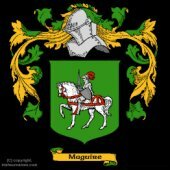 According to Hardiman, Brian Maguire of Tempo was a son of Colonel Constantine Maguire, the hero of Aughrim. Brian married Bridget Nugent of Coolamber, Co. Westmeath. They had five sons. He was an officer in the Honorable East-India Company's Native Army in Bombay. Though his memoirs make entertaining reading, he was a thorough paced scoundrel in the Tom Jones tradition. The Tempo property was escheated to the crown by reason of the adherence to King James II of the Brian Maguire who was killed at Aughrim; but his son Brian succeeded in redeeming it. Hence the family was still in posession of the estates in Carolan's time. Notations are courtesy of Carolan, the Life and Times of an Irish Harper by Dónal O'Sullivan v 1 p 214 Celtic Music Edition 1983. Courtesy of Vivian and Jack Hennessey, IrishPage.com, 2004.